It is perhaps at times of world crisis that thoughts turn to what we have done and what we can still do for our planet. FOGS have traditionally supported both heritage and environment and, given the possibility of public funds becoming less fluid, we in Banffshire, Aberdeenshire, Kincardineshire and Moray can be proud of our private involvement in conserving our unique cluster of sacred monuments. While we mourn with our American brothers and sisters the loss of fellow travellers, we also spare a thought for those in Afghanistan who may have lost everything. Our own heritage is not in immediate danger of being wiped out by a sudden coup, but we are well to remain alert to changes which may happen as a result of consolidation within Europe. Umbrellas, after all, should provide basics, i.e. shelter. While there remains a significant gap between FOGS’ concept and that of deskbound administrators in a government department of what is of ancient and historical importance, there is still a place for us to keep our ‘on-the-ground’ vigil. or, like the Picts, the demarcation of land by the placing of sacred stones for all to see. While none of us would want to return to days of invoking earth spirits with sacrificial offerings in order to stay famine or plague, it is not without purpose that the Northeast remains one of the most beautiful landscapes in which to contemplate our beginnings – and possibly even our endings. While attention is focused on stones – even local press have dropped their usual confrontational items to cover the county-wide survey by RCAHMS – it is comforting to know that there are still stones to be ‘discovered’ after generations of stone-hunting. Found recently, embedded in a farm steading at Bourtie, is another incised cross-stone, similar in design and date to that sited in the coping of the kirkyard wall surrounding the ancient little church on its hillside setting E of Inverurie. The second find is yet another example of seventh/eighth century traffic of missionaries through the Northern Pictish territories at a time when the spread of Christianity was in its infancy. 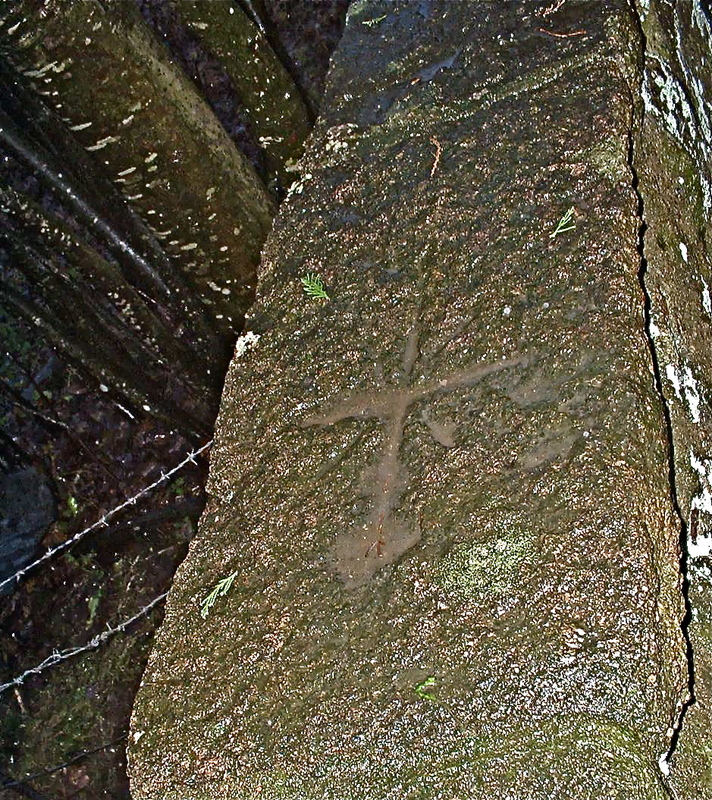 Such crosses are simply cut, usually in a semi-portable stone, with no other ornament. It has been suggested they mark ‘pillows’ of the saints who converted individual communities. Invariably, later medieval practice was to incorporate such cross-stones within church lands or, like a similar [larger] stone at Afforsk [NJ696 208], to mark church boundaries. 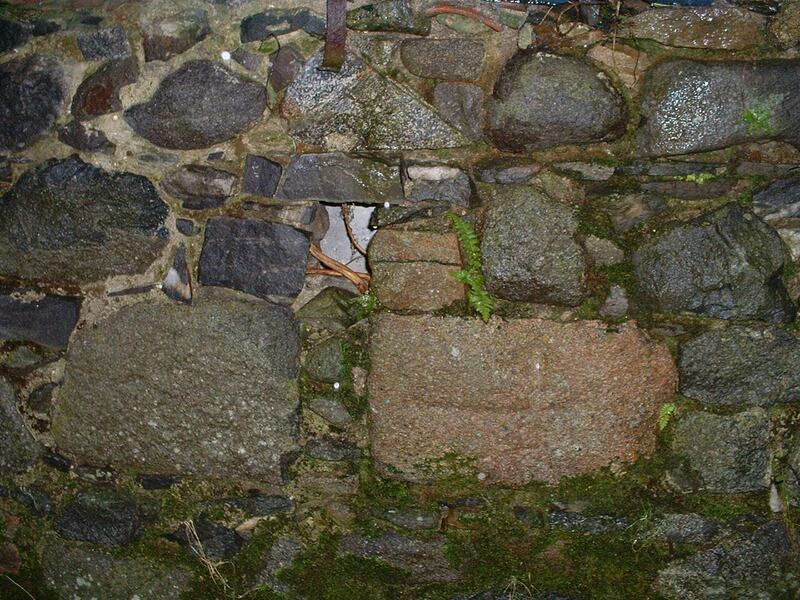 The Bourtie stone is built into the steading in a horizontal position [NJ804 249], unlike another early cross-stone in Inverurie which is built upright into the wall of the Freemasons’ Hall [NJ777 214] on the High Street. Sadly two further cross-stones in Inverurie at the Castlleyards [Bass kirkyard], remarked on by James Ritchie in 1911, are now lost. However there are still remarkable examples of this type of sculpture at Monymusk, Cothal-Fintray, Tullich, Migvie, Dyce and Dunecht. FOGS have been wondering when the Pictish symbol stones and their companion cross-stones are to return to St Fergus’s kirk, Dyce, as promised by Historic Scotland, who removed them to Edinburgh in 1997. Recent response to our request for an update indicates that Historic Scotland are providing funds for Aberdeen City Council to do the work of consolidating the kirk. FOGS have offered to assist in a small way, e.g. with the provision of an interpretative signboard, once work is completed and a new shelter is in place. According to Historic Scotland CEO Graeme Munro, this may not materialize until 2002. Dyce stones may be viewed meantime by appointment at S.Gyle Conservation Centre [HS]. Following exclusive coverage in our spring newsletter and your many letters to Parliament in support of RCAHMS, the unsung heroes of the Royal Commission’s ground force are continuing their massive survey of Aberdeenshire, the last county in the series begun in 1908. While much has been added to the National Monuments Record over recent decades, we await results with interest as the ‘Strathdon’ survey turns over every rock. Watch this space. Following their kind invitation to hold our 2001 AGM at the medieval Bishops’ palace of Fetternear, team project directors Drs Penny Dransart and Nick Bogdan excitedly revealed an array of new discoveries at the excavation site outside Kemnay. In addition to expected evidence on the enormous size of the palace grounds, it appears to have been the successor to a series of sacred buildings, with earlier [Bronze Age] settlement occupation on high ground at the palace rear. Also on this plateau were found worked flint and other tools linking the site to possible earlier use of the ground in both Neolithic and even Mesolithic periods. James Kenworthy, Paul Gerderd and a keen group of volunteers [both student and FOGS-based] assisted the progress of work on this most intriguing summer project. 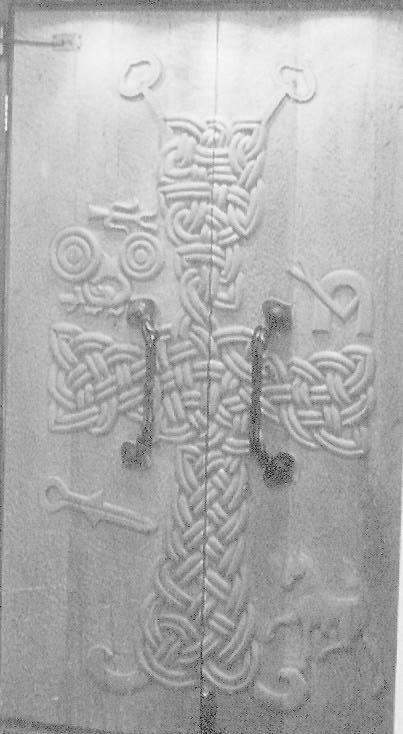 If further funding can be secured to ensure an eighth season in 2002, it is possible the true strategic significance of Fetternear within the history of the Pictish Church in the North may become clear. It is also thought that its Jesuit links at the Reformation are an indication of its dominance as an ecclesiastical centre, dating not only to the time of the Norman kings, but to a place of sacred sanctuary or monastic foundation, the focus of education, pastoral care and religious works from the Pictish era, when eighth-century Class II Christian carved stones begin to appear. Because of the very few Class II stones within Aberdeenshire [by comparison with a relative bevvy of such beauties in Moray, around Elgin, Spynie, Gordonstoun, centred on Kinneddar], any discoveries of this kind of sculpture at Fetternear would make the project directors very happy indeed.